IGD is excited to introduce four new English-language zines about various struggles in Mexico. Below is a brief summary of each with links to PDFs in the available formats. The zines are also available in IGD’s library. This zine is based off an interview published on It’s Going Down with an anarchist compañera from Mexico City deeply involved in a variety of solidarity and organizing efforts with anarchist prisoners in Mexico. It covers a lot of ground, including the conditions inside Mexican prisons, the cases of several anarchist prisoners, how anarchist prisoners are organizing resistance and autonomy inside the prison walls, and the ways anarchists on the outside manifest solidarity with their locked-up comrades. 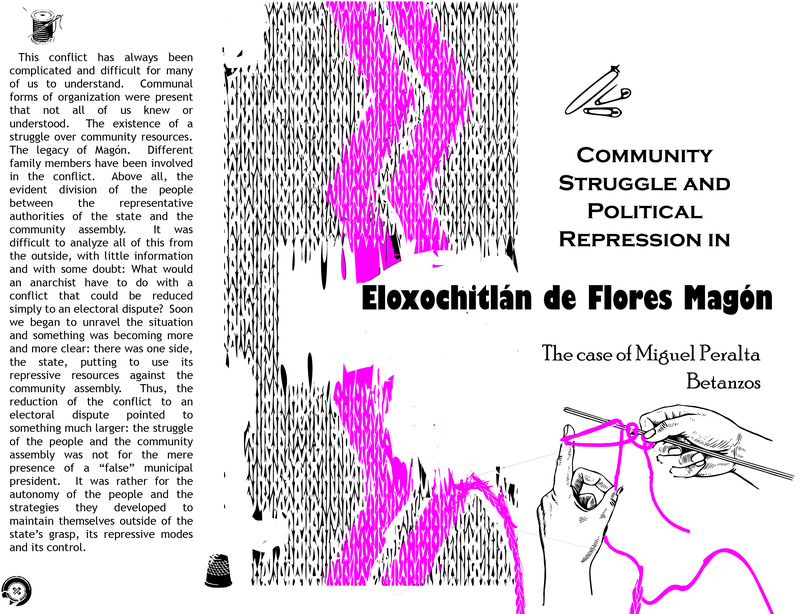 This pamphlet provides a look at the struggles of the indigenous community of Eloxochitlán de Flores Magón and one of its prisoners, anarchist Miguel Peralta Betanzos. The birthplace of Ricardo Flores Magón, Eloxochitlán has been the site of intense struggle for community autonomy, territorial defense, and against the imposition of political parties. The pamphlet contains articles about the history and struggle of Eloxochitlán de Flores Magón, letters and statements from other political prisoners from the community, and a collection of writings by Miguel Peralta Betanzos. This collection includes both “There’s Nothing Anarchist About Eco-Fascism,” and “Not Our Comrades,” two texts from It’s Going Down by Scott Campbell. Both take aim at “eco-extremist” groups in Mexico and beyond which have attacked anarchists.